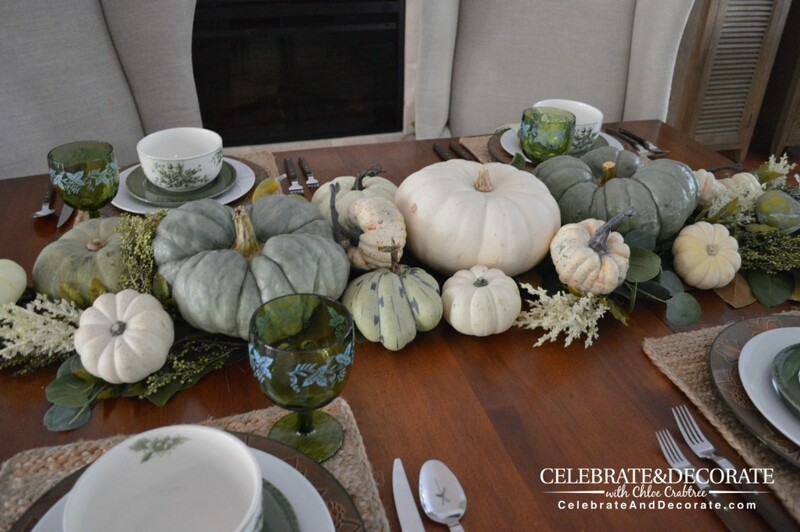 I have fallen head over heels for all of the beautiful colors of pumpkins so widely available these days and was so excited to use them in this green and white tablescape all designed around these pumpkins. I hope this gives you some inspirations for your Thanksgiving table. I have had a difficult time down here in Florida finding a good garden center, so finding the pumpkins has been a little bit of a challenge. 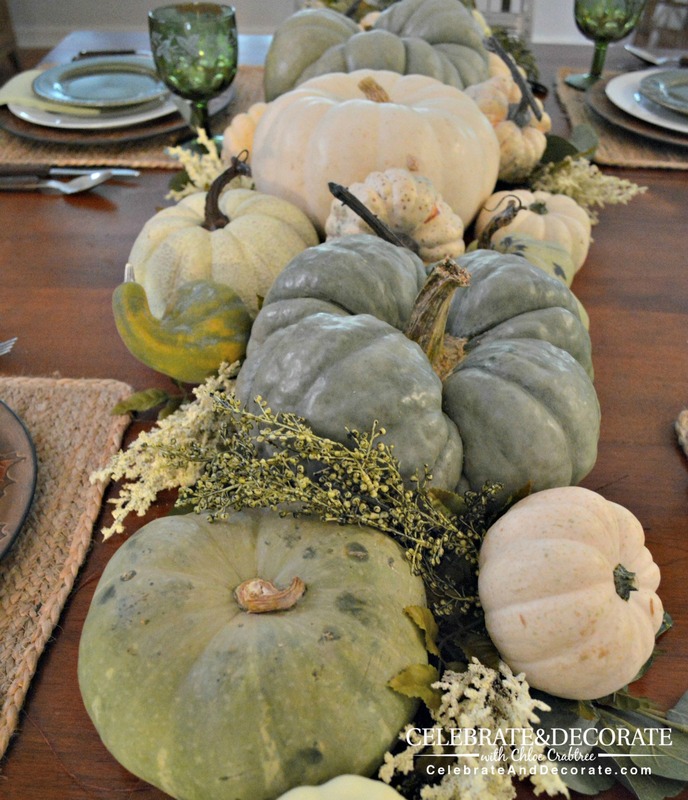 I found them here and there and then I added in a few faux pumpkins and gourds to fill in my centerpiece. 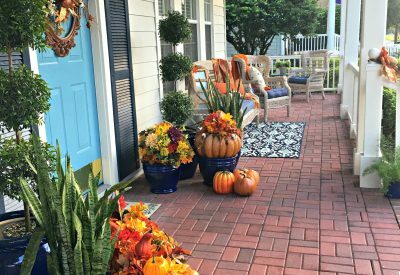 I began with an artificial garland of magnolia leaves and then tucked the pumpkins and gourds all along it, with the largest being in the center. The white flowers are artificial white heather I picked up at Hobby Lobby. I also mixed in some artificial eucalyptus. I began with a sisal placemat and topped each one with a Fall charger. I love these wood-look chargers by Better Homes and Gardens for Walmart. 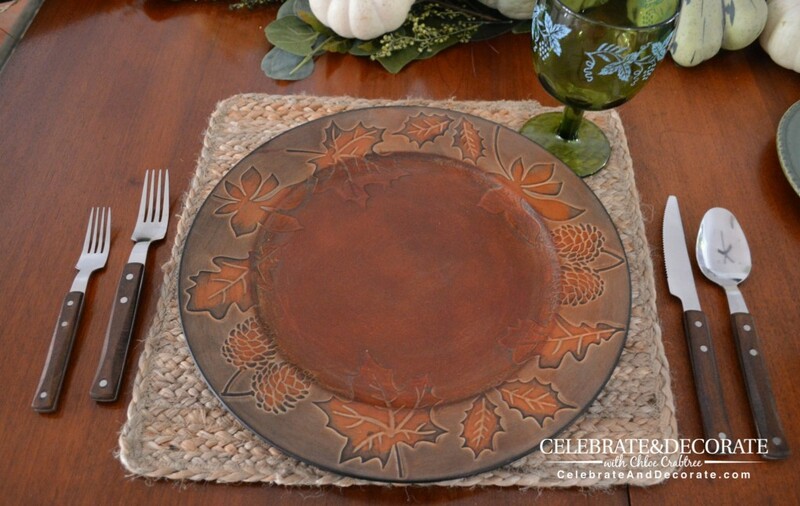 With their leaves and pinecones these are perfect to set the stage for a Thanksgiving table. My natural wood flatware is from IKEA and the green goblets are from my mother. 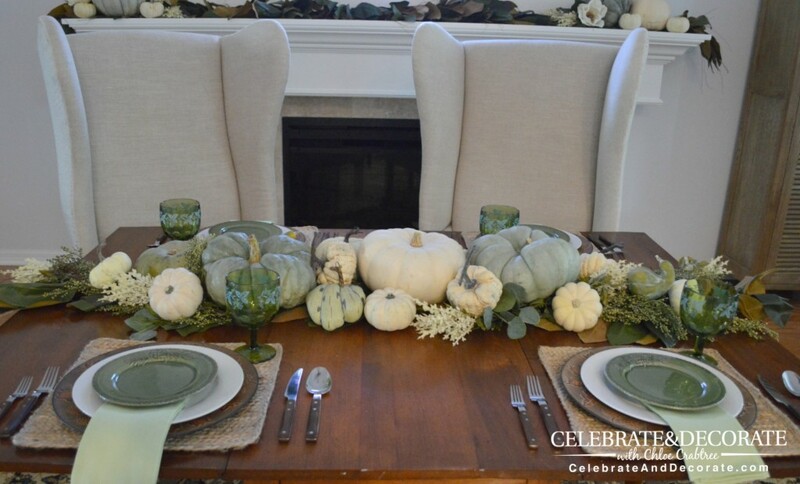 I added a white plate to coordinate with the white and green pumpkins I was using for my centerpiece. It is always great to have a set of white dishes, they are like a little black dress for your dinner table. 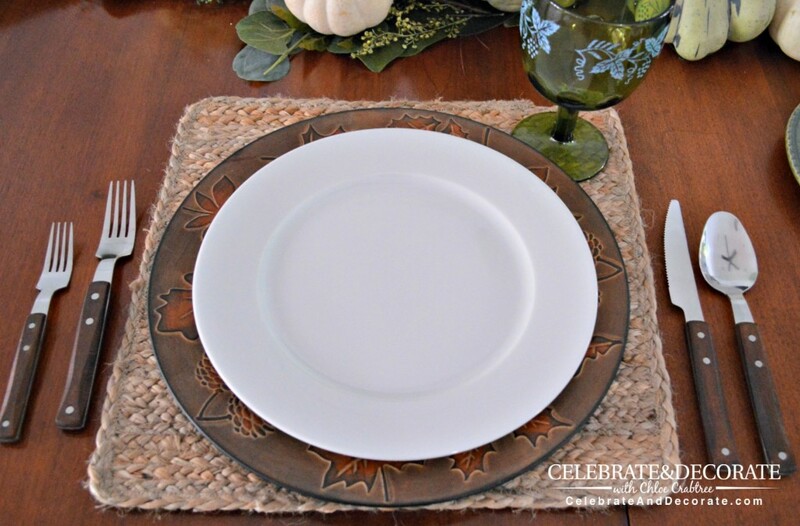 I topped my white dinner plate with green salad plates in the Sierra pattern by Bonjour. These are just perfect for using from October through Christmas with their pinecone and pine needle design. I tucked a light green napkins beneath each salad plate, once again, trying to incorporate as many of the colors of the different gourds and pumpkins. I really fell in love with these beautiful bowls with the elegant pumpkins on them. Can you imagine me serving up pumpkin soup in them? These were the perfect top to my plate stack, repeating the white from the dinner plate and incorporating the green from the salad plate. This combination made for a beautiful tablescape with the green and white carried through from the natural elements to the dishes and glassware. I love using a low tablescape like this that runs the length of the table. 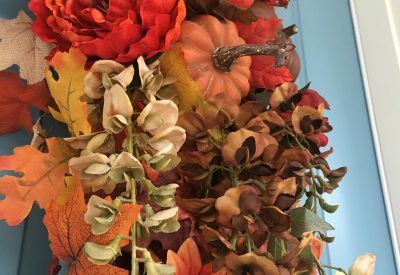 I had so much fun creating this Thanksgiving tablescape. I hope you are enjoying your Fall and all of the bounty of the harvest from our farms and gardens. I know I enjoy visiting the various Farmers’ Markets in my area. I look forward to Thanksgiving when family and friends will gather together. I will take this early opportunity to say how thankful I am for you, my readers. I really appreciate all of your comments and feedback and I look forward to hearing from you. I love this soft palette and it is so different than the traditional autumn colors. Beautiful table as always. Thank you Sandra, I love these soft colors. Your autumn table is beautiful with the white and green hues. The stack of plates and bowl is lovely with the hues. The bowl with the green and white pumpkins is pretty and this is a set of china I bought at Home Goods of dinners, salads, mugs, and bowls, plus platters, compote, creamer and sugar bowl. 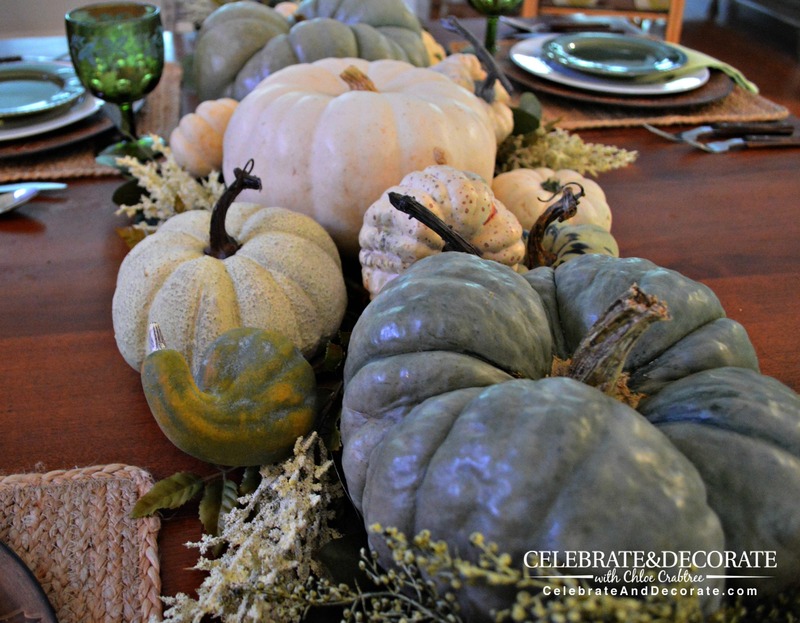 Your centerpiece of pumpkins, gourds and greener is fabulous! Oh,wow, Pam, all I saw at Home Goods was the bowls and the mugs. I just had to have those bowls! Thanks for stopping by! What a gorgeous table. Love the subtle colors. Gorgeous. I love pumpkins as well and in all colors. Love your plate stack! Thanks for this wonderful post. Thank you Valerie, and thank you so much for stopping by to check it out! Your Thanksgiving table is beautiful! 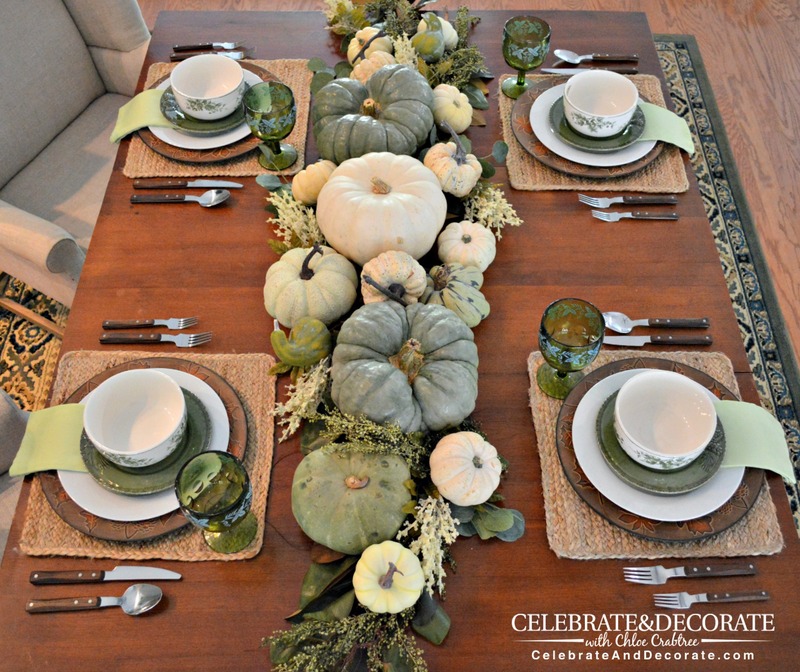 I love using pumpkins for Thanksgiving, and the soft green pumpkins look great! Thank you Sherry, I am so loving those soft green and white pumpkin colors. 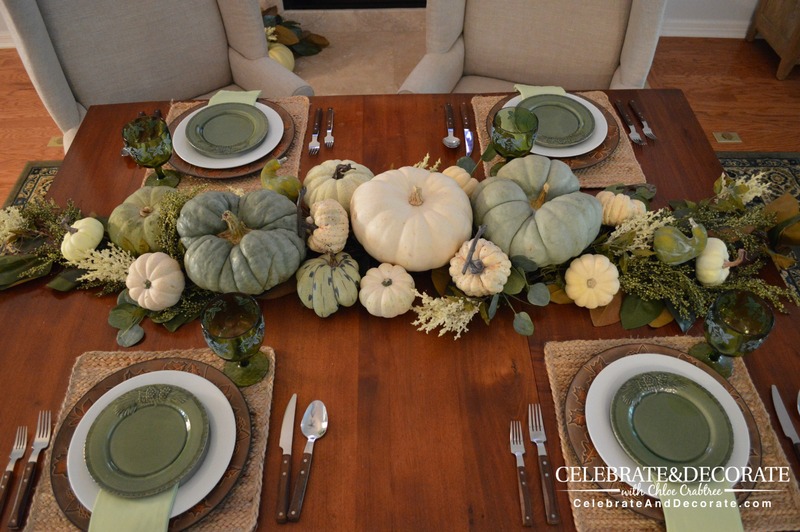 I love white pumpkins and I love the addition of green ones to your table. They can sometimes be hard to find, but I’m really starting to prefer them over the orange. Beautiful tablescape Chloe! Thanks Dawn, I REALLY love them. I think next year I will consider painting some with some pale blue chalk paint! That’s a great idea Chloe. If you can’t find them, make your own! This is the loveliest centerpiece and tablescape I have seen in a long time! Really enjoy your style and will visit your page often. Thanks for sharing! Oh my, Kathy, thank you so much for your sweet words! Oh Thank you Cynthia, but that is a little cheat, with not much furniture yet, I set up my table in the family room in front of the fireplace. This is BEAUTIFUL! 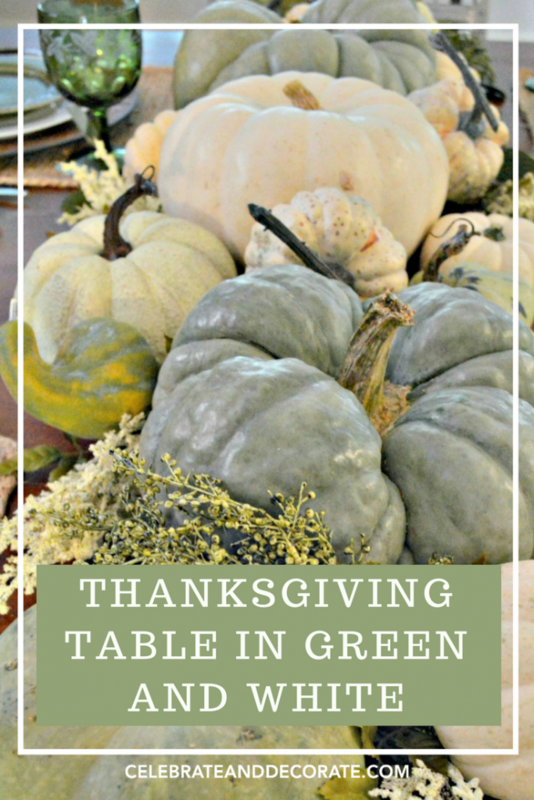 Green is my favorite color, and I love the shads that you have in this restful, thankful centerpiece. Thanks for the inspiration. Thank you Pattie, Green has always been my favorite color, but now I am going with blues in the new house and I am so excited for a new color palette. This is seriously beautiful! Thanks so much for linking up for the Best of the Blogosphere Linky party! I loved it so much that I chose you to be featured this week! Head over to my blog to check it out! Thank you so much Chelesee, I am heading over to Southern Beauty Guide! Green is one of my favourite colors, I really love this tablescape. 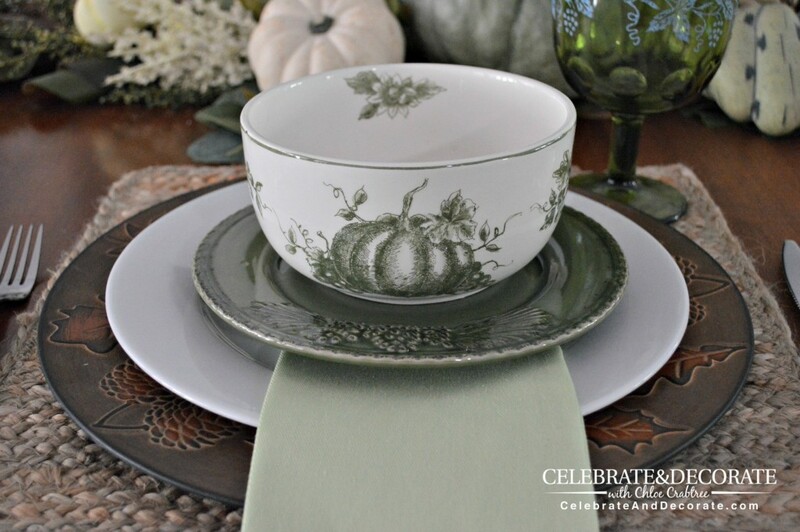 Green salad plates are lovely and soup bowls perfect for this table set. Lovely! Thank you so much Donna! Green was my favorite color for most of my adult life, but I am really falling in love with blue these days! Oh, gosh, that’s pretty! 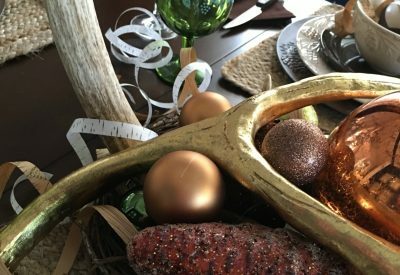 The centerpiece is gorgeous, and your bowls are great! You know me – I love the touch of vintage with your mom’s glasses. Green is a beautiful color, in all its hues. Just beautiful Chloe! I love the feeling of calm this limited color palette creates, it’s kind of like a big sigh, and a feeling of “I’m home” Love the serene greens! So happy to have a second look at this gorgeous table! At first I was thinking “green and white”? But wow, it is really lovely! You always inspire my tables! Thank you! Thank you so much Morwenna, I love the unusual colored pumpkins, it was fun to use dishes I already had to mix up with them! Chloe, what a gorgeous table! 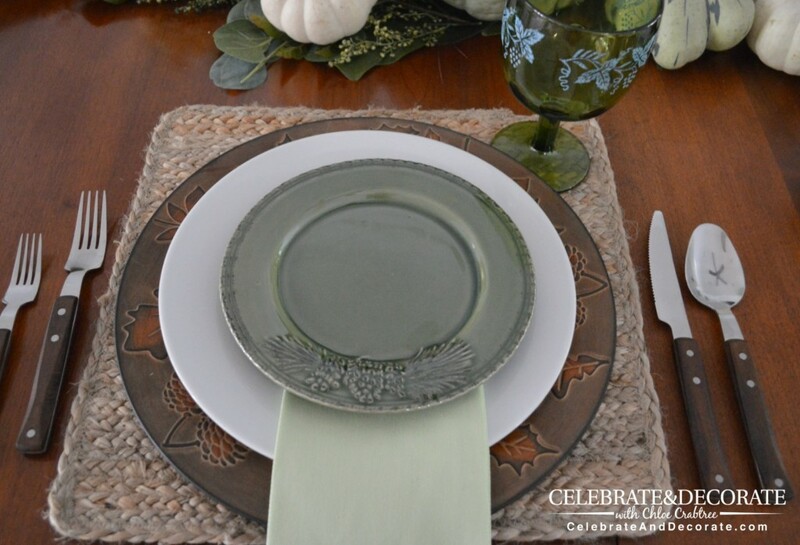 The centerpiece runner is the piece de resistance and the soft shades of green are perfect. Thank you so much Pam. I was tickled to find all of those unusual green and white pumpkins! Chloe, You are a super talented lady. Thank you for sharing! Happy Holidays! Thank you so much Donna. I am so grateful to have this platform to share all of my ideas!